New York Democrat candidate for Congress Alexandria Ocasio-Cortez listens to Michigan Democratic gubernatorial candidate Abdul El-Sayed speak at a press availability after a campaign rally the two held on the campus of Wayne State University July 28, 2018 in Detroit, Michigan. Alexandria Ocasio-Cortez may have shaken up the world, having gone from a bartender to Congresswoman-elect, but she may not have been ready for the thoroughly gentrified Washington D.C. rent. 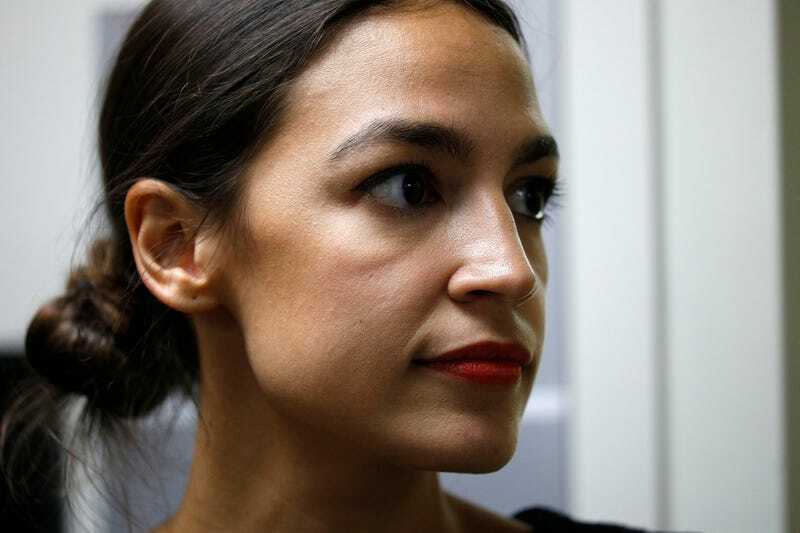 The 29-year-old told the New York Times on Wednesday, that she won’t be getting paid for the first three months that she’s in Congress and as such it’s making it almost impossible for her to find an apartment. After the story went viral, Ocasio-Cortez tweeted about the situation. “There are many little ways in which our electoral system isn’t even designed (nor prepared) for working-class people to lead. This is one of them (don’t worry btw - we’re working it out! ),” she wrote. Look, after that three month-waiting period—which, why and the hell does it take three months for Congressmembers to get paid? Maybe we should write to Congress about this—Ocasio-Cortez will make $174,000 per year. Ocasio-Cortez became a national darling after declaring she was running for office. She has now become the youngest woman ever elected to the U.S. House of Representatives. “The democratic socialist defeated Rep. Joseph Crowley, the No. 4 Democrat in the House. Her victory shocked her as much as it shocked the political establishment. She clapped her hands to her mouth on live TV as she watched the results at her campaign watch party,” NBC News reports. And for the next three months, at least until her baller salary kicks in, Ocasio-Cortez is still one of us.